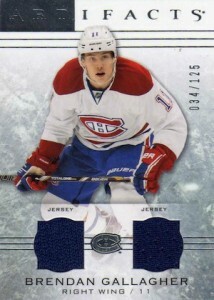 Artifacts aren't in short supply in 2014-15 Upper Deck Artifacts Hockey. The brand returns as a memorabilia-heavy early-season release. Every ten-pack box promises three multi-swatch memorabilia cards including one that has two or three players. Hobby boxes also have an autograph, a Rookie Redemption, a pair of numbered rookies and a handful of other numbered cards. 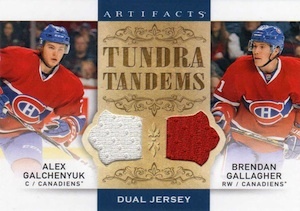 Because memorabilia is such a focus, it should be a surprise that 2014-15 Upper Deck Artifacts Hockey has several different themes and inserts to showcase them. Tundra Tandems (1:22 packs), Tundra Trios (1:42) and Tundra Sixes (1:160) all have three levels of numbered parallels. While basic versions come with simple swatches, parallels feature a mix of patches and premium jersey pieces. 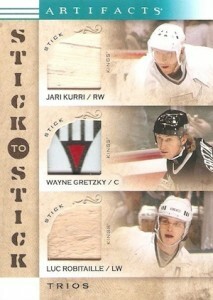 Stick-to-Stick Duos (1:480) and Trios (1:360) have parallels the have the stick piece replaced by tape. These parallels are numbered to 7. Other memorabilia-specific sets include Treasured Swatches and Frozen Artifacts. According to Upper Deck, 70 percent of hobby boxes have a memorabilia card that's either a patch, stick, tag, strap or has six pieces. 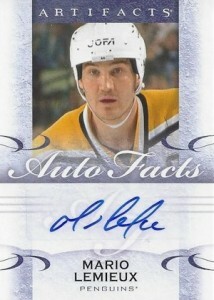 Auto-facts (1:13) are the easiest autograph cards to find. 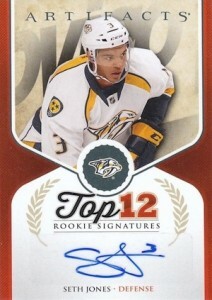 Other signed cards include Top 12 Rookie Signatures (1:960) and Top 12 Rookie Signatures, 13-14 Update (1:480). 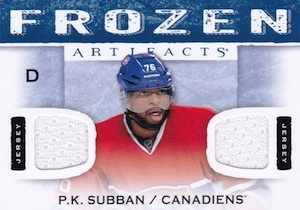 The 2014-15 Upper Deck Artifacts Hockey base set has 100 cards. It's joined by Rookies and Goalies subsets. Both of these are numbered to 999. Rookies fall two per box. Goalies are one per box. Hobby boxes also have one additional numbered subset card. Base and subset cards also have several parallels: Ruby (#/599 for base, #/499 for rookies and goalies), Emerald (#/99), Sapphire (#/85), Spectrum (#/25) and Black (#/5), which autographed and unsigned versions. One parallel numbered to 99 or less is in each hobby box. In addition to these, base cards are used as the basis for several memorabilia and autographed memorabilia parallels. These are all numbered to 125 or less and have two swatches. 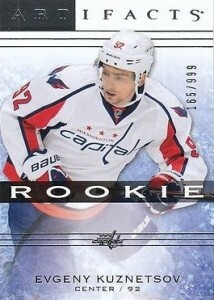 Rookie Redemptions return, falling one per box. These are good for players debuting in the 2014-15 season but wouldn't be ready in time for the set's release. Autographed Rookies Redemptions are inserted 1:160 packs. 140 cards. Some cards are autographed and are noted below. Any news on the checklist? No Wild players in the entire set (well one single auto of Harding)??? 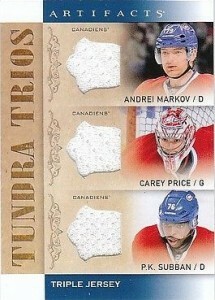 Is there no Phil Kessel cards in this set?? No Patrick Kane cards?? One of the best players in the WORLD . 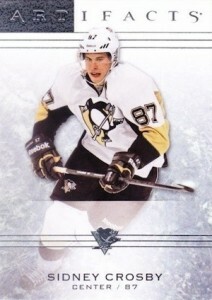 Certainly the most electrifying player and no cards in this set??? Come on…. No Claude Giroux cards? He’s the Captain of the team and runner up to the league MVP. I see Upper Deck is off to a great start with having Hockey all to itself. Hope this isnt what I have to look forward to for upcoming products! Bought two boxes, very disappointed. I would have liked to get at least half in value of what I paid for the box. High Numbered cards are of no value. They need to start put more auto and memo cards in the products. It is too easy to throw in variations of numbered cards. Agree with the fact that some teams aren’t represented very well. Wild should definitely have some other players. My Coyotes are definitely not represented well. Not a set I’ll be collecting anytime soon. Like the product, but a few guys/teams need more love. Guys like Mike Brown and George la rock do not need to be in any set period. Price is a little high but it is very enjoyable when you find the thick cards. Anyone know if ud gives promo collecting essentials? It would be nice if the mailed card book sheets or even ud dealer points so they have more useful ways to help attract and keep collectors. Or have choices on redemption ccards like card holders, binder etc. Does anyone know anything about the Rookie Redemptions? 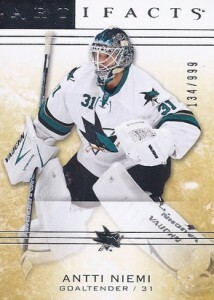 I have the Wild Card # 192 and the San Jose Sharks #174. Please leave any information about the Rookie Redemptions… I want to bid on more, but afraid I will receive junk. Jason Hesch � UD hasn’t released names yet. I have always loved buying the boxes of the artifacts every year. Last year seem to be my most favorite boxes to buy. Until tonight when I bought a box of the 2014- 2015 artifacts I was ripping through the packs and I was getting absolutely nothing until I got to my second to last pack, I opened it up and the second card was a auto facts card signed by Wayne Gretzky now I just kept repeating to myself, I just pulled a Wayne Gretzky auto card, I just pulled a Wayne Gretzky auto card, etc,etc,etc. I actually almost passed out. now I know it’s not directly signed on the card and yes it is a sticker but you know what? I can finally say I pulled my own Wayne Gretzky card. I really don’t care how much it is worth money wise because that one card is priceless to me and that what keeps me coming back to buying cards and collecting them. Have most sets from years past. Worst set to date. AMAZING BREAK!!! Bought a 16 box case on sale and received a ton of GREAT VALUE$$$ some really nice low SP HITS! First 8 box case was ok, but 2nd was what really made it worth while. Better value than I’ve gotten out of a case of Ultimate. But it’s all part of the game, sometimes you get the breaks, sometimes you don’t! :) Great value as I got a 16 box case 600+tx off so was worth it but at 1600 originally would have been overpriced.